Google has updated its Penguin algorithm with the new 3.0 iteration, making it a major update since last year when Penguin 2.0 was rolled out. The original filter was introduced in 2012 and it was designed to target sites deemed to be spammy, especially those violating Google's guidelines regarding link-building. Google has improved this filter and the Penguin 3.0 is said to be much more efficient, although we don't yet know exactly how much. The basic idea is to bring up quality content on SERPs (Search Engine Results Pages) rather than content that has good SEO. Penguin is conceptually focused on removing webspam and sites that use 'black hat' SEO techniques, such as cloaking, keyword stuffing, hidden texts, etc. Unethical tricks, in other words. If you got hit by Penguin, then you are in trouble. It means Google doesn't like your site! And it's that serious. You seriously need to think over some things, because chances are, you are spamming or tricking users in some way even you might not realize. Don't worry though. While difficult, recovery is possible. This update is the third major update, but the sixth overall in the Penguin line. The 3.0 number isn't official, rather something SEOs have come up with. The first Penguin, the 1.0, was rolled out on 24th April 2012, and it impacted about 3.1% of all search queries. After two small updates, Penguin 2.0 was released in May 2013 which impacted about 2.3% queries. A 2.1update followed in October, and this was the last update in the Penguin lineup until now, with the rollout of Penguin 3.0. This latest Penguin release is one of the most anticipated algorithm updates in Google’s history. Some publishers have been desperately waiting for the refresh that arrives just over a year since the last. Improved algorithmic efficiency aside, this is good news for publishers. If you’re hit by it, even if you make changes, you have to wait until the next release to see if your changes have done what Google wanted. So publishers hit by the last version of Penguin — back in October 2013 — have been waiting until now to see if actions they’re tried such as removing spammy links have worked. If so, they’re likely to see an increase in traffic soon. Some people may see ranking drops but not actually be hit by Penguin. That’s because if Penguin causes a wide range of links to be discounted, those links will no longer pass along the credit or act as “votes” as they once might have. Sites that gained from these fake votes — as Google would consider them — lose that credit and thus potentially visibility, even though they weren’t penalized by Google directly. If you're looking to undo the damages done by Penguin, here are posts that contain all that you need to lift the penalty. How To Recover from Google Penguin Update Penalty? 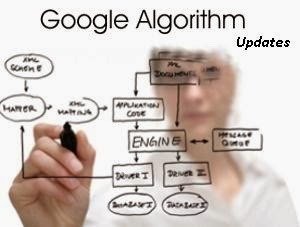 If Google Has Rolled Out Algorithm Then There should be change in Page Rank and also there should be indication in webmaster , I Don't So It has rolled out .